It's the Autumnal Equinox! Happy 1st Day of Autumn Everyone! I've been working my way through 2 very different books recently. One is a quick, easy read that I can read with my 7 year old that has a lot of information I already know but it's the kind of stuff I want to share with my little guy. The other is the kind of book that I want to get through, but I'm struggling because it's a bit more complex reading and by the end of the night I'm thinking I should just watch the PBS documentary that goes along with the book. Then there's an appendix (which is Growing A-Z a guide on how, what & when to grown each veggie,) resources, etc. I liked the chapter on foraging. It brought back a childhood memory I have of being out early one morning with uncles and cousins and my family, walking through a mossy woodland forest in Canada, collecting mushrooms and maybe fiddleheads. (My uncle Clement could identify what was safe to eat. I wouldn't attempt that on my own.) It also reminded me of last month at a fruit farm here in CT when the Asian women on the truck with me asked the farmer if they might be permitted to pick the nuts from the Chestnut tree growing at the edge of the property. He turned them down. I wonder if he had plans for the nuts himself. What I like about the book is that it doesn't have to apply to "city" homesteaders. I'm just looking to be more self-sufficient and the information is helpful. The chapter on preserving food offers different ideas and things I might actually try! After all, if I'm growing all this food, I don't want any of it to go to waste. I also enjoyed the chapter on caring for the home, although I'm all set in the compost department, which covers the largest section of this part of the book. Yesterday while I was reading the book with my cup of coffee, I was inspired to run out to the garden! This was my harvest. I cleared out some weeds that had taken over a row and prepped it for the lettuce & arugula I'll put in soon. It's about global warming, which sparked an interesting discussion with my 7 year old, who apparently has been informed by an older family member that there's no such thing. This book sets out to prove that carbon dioxide buildup is causing global warming, but with my son I'm steering the conversation towards fossil fuels and natural resources & alternative energies. Honestly, while I'm getting a lot of out parts of the book, other parts have me lost and putting it down for another cup of coffee. My Blog Turns 3 Today! Looking back 3 years ago, I never would have guessed that I would have readers from around the globe, or what an amazing experience this would be. I've connected with other bloggers out there and made friends & connections I never would have otherwise. The other main benefit is that it's been a constant reminder to live GREEN, to keep reading up on related topics, to research and seek out information. I've found really informative websites, all kinds of vendors, and talked to so many people who are GREEN in their own ways and inspire me to keep it up. Funniest or most unexpected things on the blog? 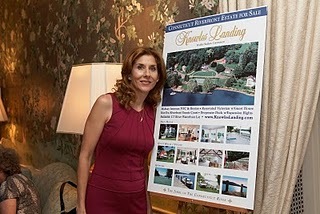 This photo of tennis star Monica Seles helping me promote my real estate listing at Knowles Landing is THE most widely downloaded photo! I get heaps of international visitors looking at it! Then there was the surprise of the author of a book I discussed on my blog actually visiting my blog and writing to me about it! Thanks, Wendy Brown! I was kind of awed by that. The other crazy-cool thing was being written about in Photon Magazine! Why this photo of me reading the magazine in bed is still being downloaded around the world is a bit of mystery to me! So how am I celebrating today? Well, most special occasions (and Tuesdays of course!) call for some bubbly and something that looks very much like chocolate cake in my opinion. I'm still hoping for both (someone message my hubby and let him think it was his idea, ok?!) but I'm also going to plant some bulbs and then tonight dinner at It's Only Natural in Middletown with my afore-mentioned main squeeze. ION was his idea - vegetarian in honor of my blog - très apropos, n'est pas? What better way to mark the occasion than by planting bulbs for Spring color! One of my absolute favorite places to shop is CT's own White Flower Farm in Litchfield. Have a glance at these beauties. 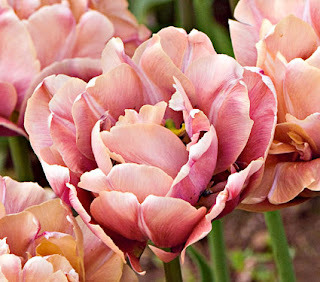 I adore tulips, especially any multi-colored, double, or parrot varieties. The ones above are divine, aren't they? (The blue flowers in the lower photo are muscari, or grape hyacinths. Love them as well - but they're tiny and it takes a lot of them to make a statement!) 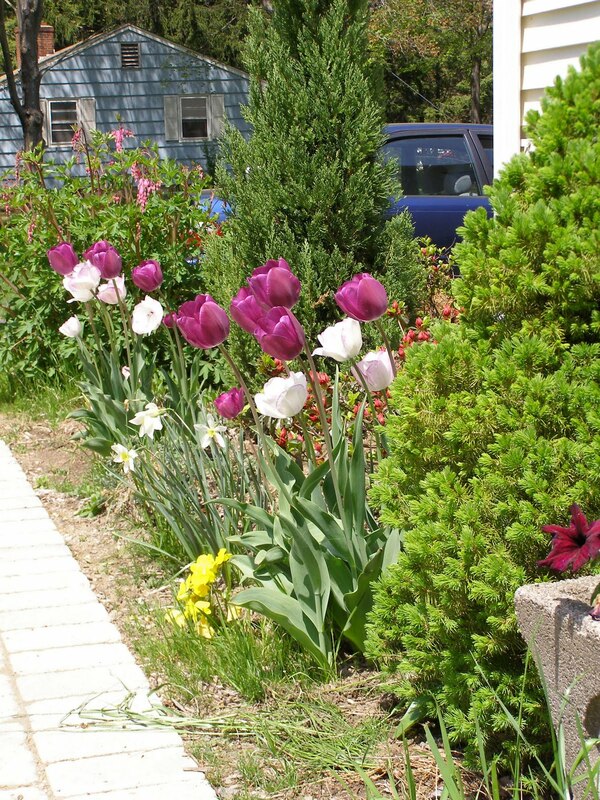 The thing to remember with tulips though is that they really only bloom for 1-2 seasons and then nothing except for a few bits of foliage. 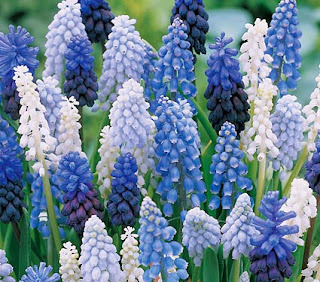 Despite this, they remain one of my favorites, and every 2 years I plant more. Here is my front walkway 2 Springs ago when I was on a purple kick. What you don't see on the other side of the walkway are the 100 crocus bulbs I planted years ago that continue to be the first signs of Spring in my yard. While I don't have beds of daffodils on this grand of a scale, I still enjoy the groupings I have spread throughout my own gardens. By the way, though I'm not doing it today, it's also time to get some garlic to put in the ground for next summer's harvest. I saved some from this year's harvest to replant for next year - now to just get my garden in some type of order so I can find a good spot for it. This is a good time to plant some cool weather crops that don't need long to mature (like lettuces, radish, greens.) I went the entire summer without buying any produce from the grocery store (with the exception of carrots - I can't seem to grow enough carrots!) and now it's time to frequent the farmer's markets up until they close for the season. I'm telling you I put off the grocery store for as long as I possibly can! In addition, planting a tree today would be awesome! 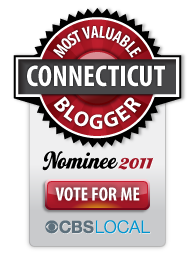 Making it an annual event to coincide with the blog anniversary - what a cool idea, right? Hmmm....maybe today's the day to plant the first of the fruit trees in the future orchard! It's a great day. I'm feeling really grateful for the friends, for the comments people leave here and on Facebook, and for the many times that my posts here are shared and circumnavigate the globe. I'd like to thank the talented bloggers who've shared guest posts here: KJ from Let's Go Fly A Kite, Taryn from Mama Gone Green, and Steve from Compostings. KJ's post continues to be THE most searched of all the posts on my blog - do you remember the Earth Day wreath project she made? It was genius. Where do we go from here? There is so much to do, and after the eye-opening experience of the hurricane/power outage and how dependent our lifestyle is on electricity, I have a much greater appreciaton for the need for alternative energies. Not that I'm going to solve the energy crisis. After all, I'm just a little blog, helping in some small way to make us just a little bit GREENER. Peace my friends. Thanks for reading every week. We sat in the dark for 5 long days...no running water. We lost all the food in our refrigerator & freezer. Trees and wires down everywhere. No cell service for 24 hrs. Then, as we were going to bed last night, the lights came back on. Cheers erupted throughout my neighborhood. Still no cable, phone or Internet (sorry no photos because I'm writing this on a computer which is not my own) but having running water makes all the difference in the world. It could be so much worse, really. So many of our friends are still without power and no hope of getting it before Tuesday. Also, my thoughts go out to the flood victims in Vermont and other areas. So I thought I'd take a sec to share what I've learned from this experience. * Hubby was brilliant when he insisted that we have a propane cooking stove 8 years ago. Brilliant I tell you. * If you have to fill your tub with water because of the threat of power outage, use duct or electrical tape to cover the drain first. Hubby knew this already, but I know people who didn't and their water slowly leaked down the drain. * Percolator coffee is excellent. We had 3 ways of making coffee during the outage and it is amazing what coffee does to make you feel like things are ok. In an emergency, go ahead and brew some joe (and bring some to your neighbors.) Somehow it helps to keep things civilized. * The generosity of friends is humbling. We had friends who got power back days before we did and were offered a place to charge electronics, hot meals, showers, laundry, and ultimately, 2 generators (as we had none.) One neighbor came by to offer her pool water for flushing toilets if we had run out. I can't thank all these people enough. More than once I was moved to tears by these offers. * It's important to check in on people. I know we're all busy trying to get by, but don't forget the seniors or single people who are sitting by themselves in the dark eating crackers. Invite them over, stop by for a chat, bring them a newspaper or magazine for something new to look at. * Having a battery-operated radio to listen to is the only way to stay connected to the outside world sometimes. Gram happened to have one and she listened to it 12 hours a day for updates and news. * The old police scanner in the basement was kind of fun to listen to the day of the storm. We knew right away how badly the town had been hit by the extent of the reports of fallen trees and wires all over town, and that we weren't going anywhere. * I am not at all GREEN in emergency mode. Paper cups, plates & utensils take center stage when I cannot wash dishes because of no running water. I did, however, recycle what I could. * As my neighbors and co-worker Deb here just reminded me, put out empty containers (like rain barrels) to collect the storm water for use later when flushing toilets, etc. * If there is a threat of power outage, stock up on the essentials early on. Water was such a hot commodity in my community that the day before the storm the grocery store was rationing how much you could buy. I was thankful that I bought mine 3 days before the storm hit. What I missed the boat on was D batteries - went to 6 stores and not a one to be found. Luckily we managed to get by with the flashlights we had. * Baby wipes and antibacterial wipes came in REALLY handy. * I don't want to criticize, but it feels like my town wasn't really prepared. There was no communication coming from town hall or the town manager. He didn't even show up to the emergency town council meeting. I heard several people complain around town about the lack of leadership and especially communication. We still had newspaper delivery, so why wasn't there information in the paper on where the shelter was, etc.? At the emergency meeting, I will say that I thought the town staff and departments worked together well to give us an update on what they knew. At Sue Weintraub's direction, they also agreed to have a sign made to be posted outside town hall with info for residents. * Fill the gas tanks. My dad always does and he was right on. My town had no gas stations open for several days. It was a ghost town until this morning when power started to come back. By the way, SHAME on the local gas stations for raising the prices of gas when they did reopen. You know what, the gas stations in towns 30 min away who didn't lose power are selling at the same much lower price it was last week. * Finally, you CAN bake croissants on the grill! I had raw dough that had thawed, threw it on a cookie sheet and about 20 min in a closed grill on a medium temp and we had a really yummy breakfast with that percolator coffee! So in a way, we were "surviving the apocalypse in the suburbs" (as I had written in a recent post after reading Wendy Brown's book.) It was a short term apocalypse. Tonight we're harboring a friend of Gram's from the senior housing in town who is still without power. I've been hearing of other good deeds too, like Jane of Fit-Trix Fitness Center here in town, who opened her gym this afternoon and set up an obstacle course for kids to come and play on free of charge, and offered adults coffee and a chance to watch the news and relax. Then there's Paul's and Sandy's who is a collection point for a family in nearby Portland who lost their house (& pets) to a fire started by a candle they had burning during the power outage. Thanks to both of these businesses for being so neighborly and doing what they can. We've been out of power for 5 days now after the hurricane. No running water and limited access to Internet or cell phone signals (a cell tower is down in our area.) I'll put up a proper post when I can get to a computer. Best to all of you. Hope everyone is safe.